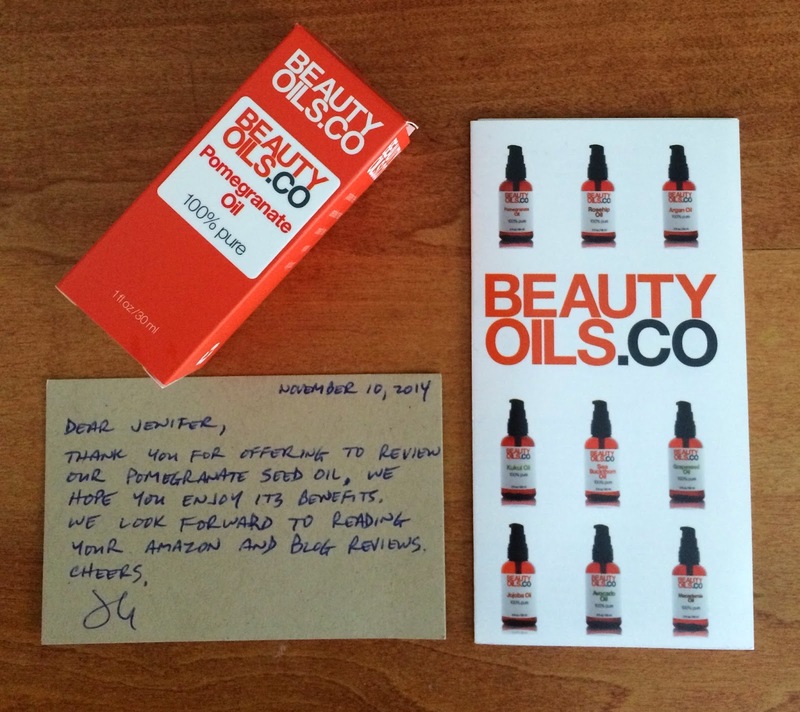 Beauty Oils is a brand that makes a number of oils meant to treat your skin. And I was quite amused by their "logo": "Fragrance Free. Preservative Free. Cruelty-Free. Vegan. All good." I think that products like this truly appeal to quite a crowd these days. It seems as though many people are waking up and educating themselves on the chemicals and toxins that are in just about every conventional store purchase they make. So here is what makes Pomegranate Seed Oil such a wonderful product to have on hand: it is full of antioxidants and essential fatty acids. These protect your skin from free radicals, cushion it against signs of aging all while promoting cell regeneration. It is recommended to use for dry, stressed and aging skin. I suffer dry skin this time of year, so it came at just the right time! 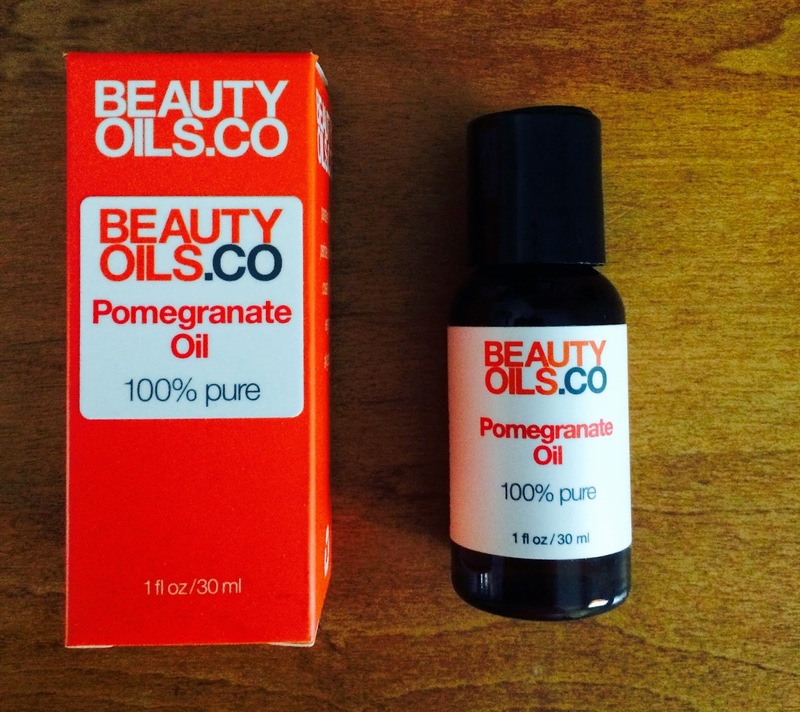 I received the 1 ounce size bottle of Beauty Oils 100% Pure Pomegranate Seed Oil. They are also available in a 2 ounce size and a 4 ounce size. I was interested to see what it would smell like, and was actually surprised to see (or smell) that it was unscented. I'm still getting used to the switch to safer products, and sometimes still expect the fake fragrance that many products have. I love when I can find a truly all-natural product that smells great, but for something that goes on my face, I'm good with no scent. I find that this goes on and looks a little greasy, but it does absorb completely so it's nothing you have to battle with. I have found that this helps keep my face from getting dry. This is such a struggle for me because I find that dry skin makes my make-up look awful, and I can't have that..... I have also been (when I remember) using this on my daughter's eczema, as it is helpful on irritating conditions such as eczema, psoriasis and sunburn. My only complaint is dispensing the product. The bottles themselves are hard and dark in color which I assume is to keep the product inside safe and effective. The top is a press-top dispenser, which is great when you have squeezable bottles. I put a lot of effort into getting just a drop or two out and often have to resort to tapping it pretty hard on my hand to get it to come out. It is easier just to twist off the top to use it. If you wish to purchase this oil, you can do so HERE. The 1 ounce size retails for $10.95, so you don't even have to break the bank! If you are interested to see their entire library of products, you can check out their website, or find them on Facebook, Twitter, Pinterest, Instagram, Google+ and You Tube. Disclosure: The item(s) discussed above were provided complimentary for review purposes. The opinions stated here are honest and entirely my own.